Crime Prevention | Northland Neighborhoods, Inc. If you are interested in learning more about crime prevention, visit our Neighborhood Crime Watch information page! Remove valuables from your vehicle. 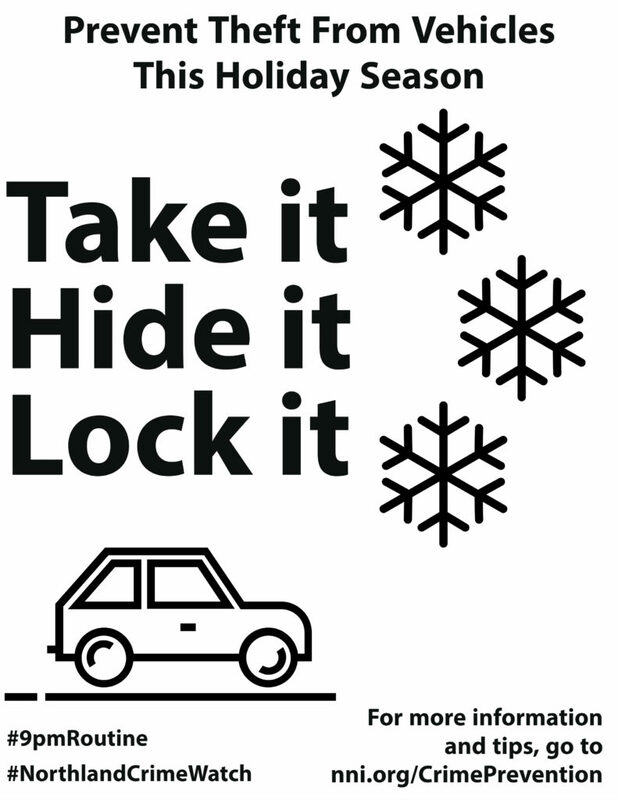 Ensure your car doors are locked, and windows are rolled up. Make sure your garage door and all other exterior doors and windows are closed and locked. Turn on your exterior lights. In the Northland, one of the more common property crimes are items being stolen from vehicles. A lot of the time vehicles are left unlocked with valuable items sitting in plain sight. Checking your car should also be included in your 9 pm Routine. Here is a list of suggestions to help prevent vehicle-related crime. Always lock your vehicle with the windows rolled up. Do not leave valuable items in plain view. Do not leave keys in your unoccupied vehicle. Make sure your license plates are appropriately secured. Remove spare change from cupholders or ashtrays. Be aware of your surroundings while shopping and taking your items back to your car. Try not to overburden yourself with packages. If you know you will be purchasing many items, invite a friend or family member to go with you. Avoid leaving packages and shopping bags visible in your car. Load them in your trunk until you are ready to go to your next destination. When coming back to your vehicle have your keys in your hand ready to unlock the doors and enter the car quickly. Avoid openly displaying your Christmas tree or packages in the front window of your home. If you are traveling for the holidays, use light timers for lights in your home, and ask a neighbor to pick up any newspapers or mail. Alternatively, request a stop from the post office or paper for the time you will be gone. Be sure that doors and windows are locked. When you are on vacation or leaving the house for the evening, turn on a radio or TV while you are away to make it appear that someone is home. Avoid posting on social media about your holiday vacation until you have returned home. After Christmas, don’t pile up empty gift boxes from your new tv or other large items. Break down large boxes so they can fit in a trash bag.